Jio continued to impress with quarterly performance and despite strong competition, operating revenue increased and the company sustained operating margins as well. 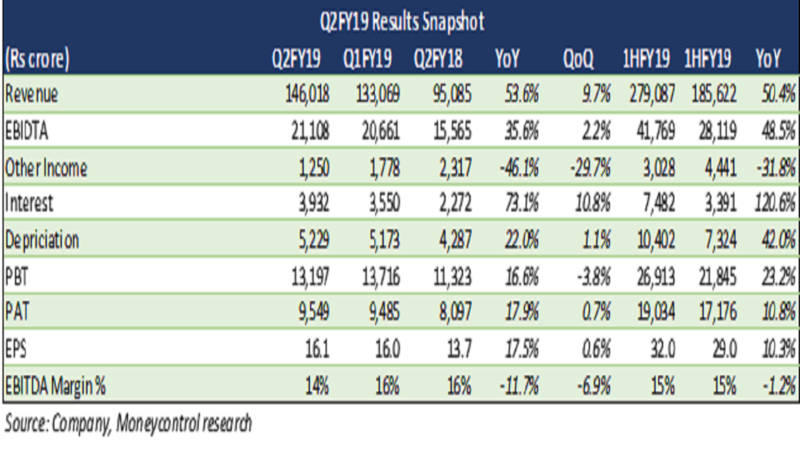 Reliance industries (RIL) reported an operationally healthy Q2FY19 with mixed performance across verticals. Although slightly soft compared to the preceding quarter, gross refining margins were substantially above the Singapore benchmark. 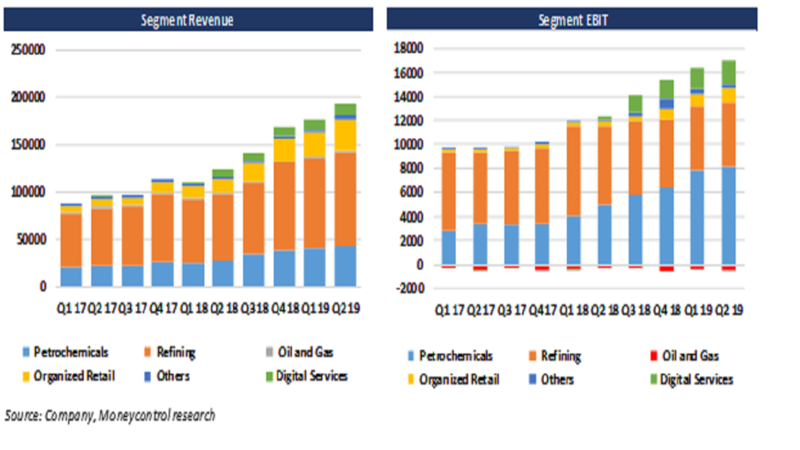 The overall strong performance was majorly driven by growth in the petrochemical, digital and retail segments. Consumer business maintained its momentum. Jio continued to impress with quarterly performance. Despite strong competition, operating revenue increased and the company was able to sustain operating margins as well. Gross refining margin at $9.5 per bbl was way above the benchmark Singapore GRM of $6.1 per, but slightly soft sequentially. While revenue increased by 41.6 percent year-on-year (YoY), the segment EBIT declined by 19.6 percent YoY. The performance was affected by substantially higher crude oil prices, soft gasoline margins, and tighter light-heavy differential. The shutdown of Fluid Catalytic Cracking Unit (FCC) also impacted the segment’s performance. Volumes in the upstream oil and gas business saw a natural decline which led to an almost 12 percent contraction in revenue, despite higher prices of crude and gas. Production from both the domestic business and US operations fell 25 and 31 percent, respectively. Accelerated store additions and traction across all consumption brackets led to strong revenue growth in the retail segment. Around 138 new stores and 535 Jio Points were added during the quarter. Reliance Retail operated 9,146 stores with an area of over 19.50 million square feet and 512 petro outlets. Operating leveraged aided a margin expansion of 155 basis points YoY to 3.8 percent. Going forward, revenue growth will be predominantly driven by network expansion across all verticals (Reliance Trends, Reliance Fresh, Reliance Smart, Reliance Digital, Jio Points). In the grocery and apparel segments, the emphasis is on improving the private label brands portfolio, developing the omnichannel network and leveraging the loyalty programme customer base of over 50 million customers. In fuel retailing, re-commissioning of fuel outlets and volume growth will be the factors to watch out for. Jio’s net revenues rose 13.9 percent quarter-on-quarter (QoQ) to Rs 9240 crore. Growth was driven by a net addition of 37 million subscribers during the quarter. Subscriber addition was higher than all competitors put together and the base has touched 250 million within 25 months of its commencement of services. Jio’s ARPU (average revenue per user) witnessed a marginal dip of 2.1 percent on QoQ basis to Rs 131.7 per month. Jio’s EBITDA margin was flat compared to the preceding quarter. Interest cost outlay increased by 29.7 percent leading to 11.3 percent increase in profit-after-tax (PAT), lower than the growth in EBITDA. Jio plans to launch JioGigaFiber and reach 50 million homes across 1,100 cities. To expedite this, it has bought a strategic stake in Den Networks Limited (Den) and Hathway Cable and Datacom Limited (Hathway). This will also help Jio access local cable operators, content producers and the companies. RIL has completed most major planned capital expenditures and the units have started stabilizing. With projects starting to deliver, the company is likely to see steady cash flows during the year which would enable further operating efficiencies and higher returns. The overall macro environment is also conducive for the various verticals where the company has exposure. With full commissioning of the ROGC and PX units, we expect great vertical integration and higher margins for the petrochemical business. The company is now focussing on aggressively expanding the retail consumer business presence. The segment has been delivering stellar growth and we expect this to continue and margins to improve further with increasing volumes.